EVERETT, Wash., Oct. 11, 2017 – A Boeing [NYSE: BA]-U.S. Air Force test team recently refueled a KC-46A tanker from another KC-46A tanker for the first time. During the four-hour flight, the two aircraft successfully refueled each other and achieved the maximum fuel offload rate of 1,200 gallons per minute. The program’s first and second tankers transferred a total of 38,100 pounds of fuel over the course of the flight. Both aircraft took off and landed at Boeing Field, south of Seattle. The milestone flight helps pave the way for the next phases of certification and specification compliance testing. The KC-46 will refuel U.S., allied and coalition military aircraft using both its boom and hose and drogue systems. 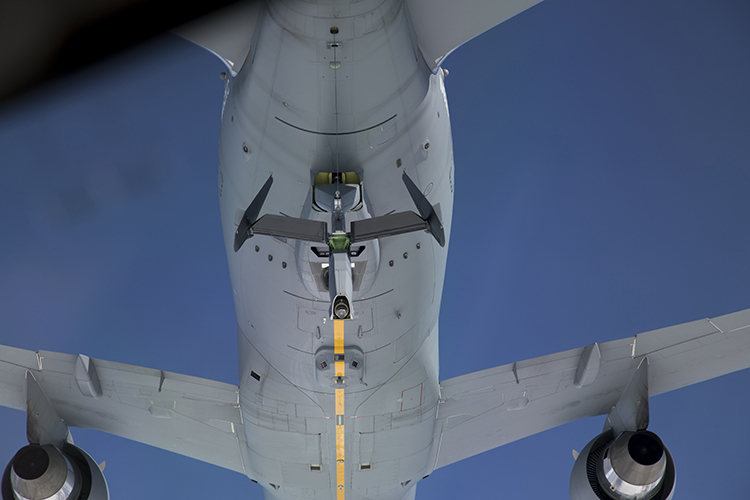 The boom allows the tanker to transfer up to 1,200 gallons of fuel per minute, while the plane’s hose and drogue systems, located on both the plane’s wing and centerline, enables the KC-46 to refuel smaller aircraft with up to 400 gallons of fuel per minute. To date, the program’s test aircraft have completed 2,000 flight hours and more than 1,300 contacts during refueling flights with F-16, F/A-18, AV-8B, C-17, A-10 and KC-10 aircraft.